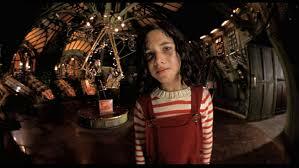 It comes as no surprise that The City of Lost Children is visually stunning. From Marc Caro and Jean-Pierre Jeunet, the film tells the strange tale of a man lacking the ability to dream named Krank (Daniel Emilfork), who kidnaps children to steal their dreams. Enter the simple One (Ron Perlman) and the plucky Miette (Judith Vittet), who attempt to rescue One’s missing brother Denree, and the film becomes a strange mixture of steampunk mystery, film noir, science fiction fantasy and love story. The best way to describe this film’s visuals would have to be the term “rich.” Lush greens, earthy browns, and deep shades of both rust and bright reds combine to give the film a look that lands firmly to the left of reality to craft a dream-like, painted quality. A lovely, demented fairy tale. What strikes me most about this film is the way that color defines a particular theme. The running colors throughout the film each have their own connotations assigned that move the plot along in a type of visual marker. Any time we see brown in this film, there’s distinct adult indifference. Many of the adults passing by have brown clothing, from the townsfolk that watch One perform at the beginning of the film to the Octopus, A.K.A. the evil conjoined twins that run the guild of child thieves. Brown figures prominently in the costuming of the Octopus (should we call them Octopi?). They don’t care about the children, and the murky shades of brown become associated with that. It’s very clear that they only want the profit of the children’s labor and consider them expendable. Threats are used to keep them in line: for example, Tadpole is threated with solitary confinement in a dark area with spiders in an effort to get him to cough up more loot. It works – Tadpole was, in fact, holding out on them. 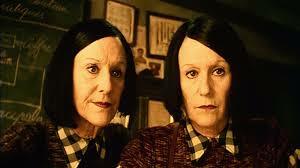 However, the introduction shows us how uncaring and solipsistic the sisters are. The attempt to kill Miette (against a brown netted background, no less) for trying to break away from them happens not because they care, but because they want to assert dominance over their money-maker. Miette is a possession and her life is expendable to them once she stops serving her purpose. Likewise, they don’t function as autonomous beings: they eat, smoke, and speak in tandem, proving that they can’t do anything on their own. Noticeh how the food and cigarettes are brown too? That’s not accidental. Who wouldn’t want to go home to these caring faces? Marcello, the circus performer with the deadly fleas, also dresses in browns and has trouble acting for himself. He is the instrument of a strange type of execution that has a passive-looking effort: first the fleas inject the victim, then he plays music which enacts the serum, which then sends the victim into a murderous trance. He appears to be a street musician during this act, and does not have to actively get his hands dirty in the act. He’s so blasé about his job that he has to outsource it to bugs. Heart of a lion on that one. He fails to act when Miette is drowning, instead choosing to wallow in self-pity with alcohol when he thinks she has died. When he later finds her alive, his idea of attemping to help her is to tell her that she needs to run away and let everyone think she’s dead. Way to be a man of action, Marcello. Through the townspeople, the Octopus and Marcello, we see that brown is the color of the indifferent. They won’t help the children, kidnapped or destitute. Those kids are on their own. Hence, they receive the most unappealing color in this film. It’s quite fitting for the tone. The greens vary in this film; however, they are without a doubt the signifiers of truth, childhood and simplicity, no matter how unsavory the details may be. From the clones’ lab coats to the waters of the sea that house the underwater lab, green is associated with the recapturing of childhood, as wella as the child-like truthfulness of the situation. 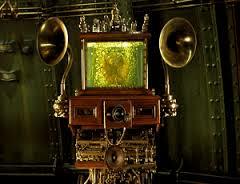 Perhaps the greatest purveyor of truth is Irvin, the brain surrounded by bubbling green water. Irvin tells the story of the Original, as well as the backstory of Martha, the clones and why Krank can’t dream. He does not sugar coat these facts, especially when it comes to Krank’s tortured quest to gain the ability to dream: he flatly tells Krank that he has no soul, and that he only brings nightmares; he suggests that Krank look inside himself rather than to others to fix what is broken. Bathed in brilliant green, Irvin delivers the predicitons of the failures of Krank’s experiments with glee: he knows that a particular child is “a nightmare factory,” and indicates this further with the flash of green nightmare images over the child’s sarcophagus. Krank has not and will not take Irvin’s advice, so Irvin unapologetically reminds him that he will fail. All of this while surrounded by green. Sure, he’s got a sadistic streak, but Irvin tells it like it is. In one of the most stunning and creepy sequences, we have the deaths of several cult members through the lens of green. While unable to see under normal circumstances, the green night vision goggle allows them to see through one eye in a brilliant tone. In a horrifying incident, this vision is manipulated so that a man is forced to watch his own death by hooking his feed up to his murderer’s apparatus. While the man is screaming that he doesn’t want to die, he is forced to watch the act happen to him. This is a direct confrontation of one’s own worst fear: the unblinking focus on ultimate demise. It’s powerful, surreal, scary and wrapped in green. In this moment, we get to peer into a primal fear that many people possess with a type of direct confrontation that those same people would not want to attempt to face. While we may not want to admit it, everything in green is honest and unfiltered. It does not care about our feelings, but at the same time, it does not hide the truth from us. Just like children, the color green shows us not what we want to see, but what we need to acknowledge in order to make progress. Finally, the vaious tones of red indicate when something is going to make progress. Red strives to make changes when it’s on the hands of the clones in the lab; it’s striped across the chest of One, who is on a hunt to find his beloved brother; it’s present in the candy apple that’s used to lure Denree away; it’s rusted onto the dock that takes the protagonists to the underwater lab. We see red bands around the stolen money, red birthday decorations for Irvin, red bouy lights in the sea. Red is everywhere that change needs to visit. The most prominent red is the Santa Claus outfit throughout the dream sequences. Whether it’s multiple Santas or Krank, the red costume is used to bring about the scientific discovery of how to dream. It fails, but it operates on the notion that a typically happy memory will induce dreams. Krank needs to progress in his quest, and thus uses this image repeatedly in order to move ahead. Krank’s misuse of red perverts the color, turning it from magical into a nightmare. Red in the wrong hands causes havoc because the weilder cannot effectively bring about change. Who does make progress while wearing red? Miette and One, whose costumes feature the hue prominently. Miette loves One and wants to help him; the color on her is less about this feeling than it is about her single-minded determination to be with him. Miette has the most red on her, and she is the one that succeeds in defeating Krank by trapping him in a dream state that destroys his mind. Her rich, vibrant red blazes the trail for the children to leave and not be troubled again by Krank. She is the ultimate progress. One’s brute strength is reflected in the red stripes he wears, but as he lacks the mental capacity to fully outsmart Krank, there is only so much that he can do. Miette – the girl in the red dress that does not give up – is the one that puts the largest dent in the rescue mission. We need the red-clad poster girl to act and set the children free. This outfit is no accident. She’s like the Santa Claus of thieves. 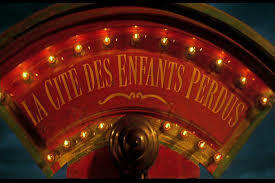 At the end of the film, the children leave the lab with Miette, Denree and One on a red boat setting sail on the green sea. The children have been freed from their tormentor that could not recognize the truth he had to face. It’s a nice touch to the gorgeous color play. We know that the children are heading someplace better because of the color associations we’ve unconsciously made while watching the film. They’re making progress and can go back to being kids.